These are used in conjunction with stainless steel banding and stainless steel wing seals. By affixing to the banding they enable the banding to compress often referred to as, mighty springs, Mity springs or compression springs. They are used to secure the insulation over insulated piping, tanks and vessels. Mity Springs or Compression Springs are assembled from components of Type 304 and 302 stainless steel or 316. They are used with strapping to accommodate expansion and contraction of large diameter insulated and jacketed piping, tanks, vessels,and equipment. Standard compression springs provide 78 lbs./inch of compression, and can be used with strapping widths up to 3/4" 19mm. 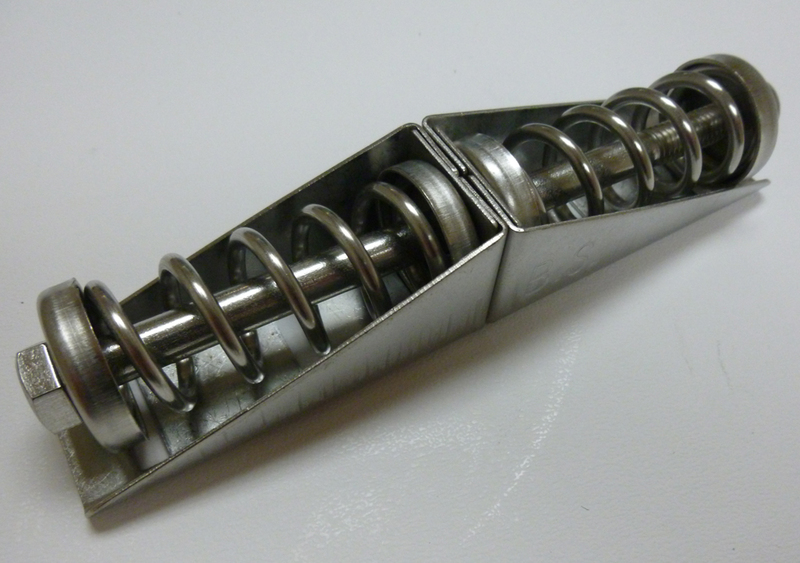 Stainless steel banding or strapping is slipped through and back over the slots on one end of the flat bottom of the spring. Strapping is secured with a 3/4" seal. Banding is extended around the object, or to the next spring, and the routine is repeated until the entire circumference has been encircled. We can also offer expansion springs and other related products to work with metal jacketing and strapping for inulation of oil and gas applications. For large OD pipework and tanks and vessles over 2.5 metres (8') closed seals or lap over seals are often used to secure the banding onto the springs.